Hello everyone! It's been a while since I posted a new blog, but life has been too crazy and exciting and fun for me to sit down at the computer for an hour or two! Two somewhat major holidays happened last week--Seollal, also known as Lunar New Year, and Valentine's Day. But before I talk about those, I just wanted to give you a little peak into my work place at SPOL English Academy. My coworkers have been sick lately. Below are pictures of them with their medicine. It's very easy to get pharmaceutical stuff here. In fact, there is a pharmacy on the ground floor of the building we work in. Charles may or may not have had strep throat, and all he had to do was walk into the pharmacy show them pictures of his throat and mime that he couldn't swallow, and BAM! he was given some stuff to put on his throat that worked like a charm. Dan actually had to go to the doctor because he has torn cartilage and a cracked something, and his drugs were super cheap (the doctor visit, X-rays, and drugs were under $100). Prescription pills come in little packets that you can tear open. you have left. Good system! The kids mobbing Dan in our office. My favorite adorable twins, Liana and Cloy. is encased in giant glass windows. They were standing right outside of them. Dan with Nana and one of his other students. Charles at his desk in the corner of the office. (or they come and chat with us inside). Monday, February 11 was Lunar New Year's Day this year. The new year typically falls on the day of the second new moon after the winter solstice. This is considered a national holiday in Korea, so I was fortunate enough to have the day off of work! For Koreans, this is a holiday to be with your family. When I asked my students what their plans were for the Lunar New Year, most of them said that they were going to their grandmother's house. They typically meant their father's mother, because when people are married here they join the man's family and the women seldom see their own family for holidays. During the new year, people perform ancestral rights called charye. 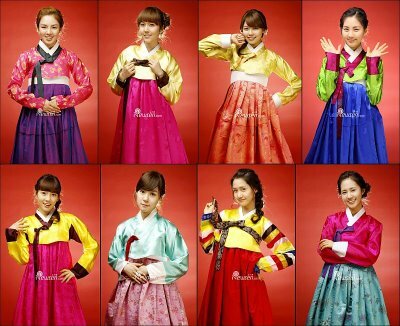 They dress in colorful traditional clothing called a hanbok (pictured left). They eat tteokguk, which is soup with traditional rice cakes, which the kids said is quite tasty. Eating the soup is a right of passage; after it is eaten, the person who consumed it is another year older. Another tradition is called sebae. In this right, children wish their elders a happy new year by performing a deep bow, and they are rewarded with a gift of money. Some of the kids made out like bandits (the highest amount I heard of was about $300). Koreans use the same animal zodiac as the Chinese do. People have certain qualities based on the year that they are born. This year begins the Year of the Snake. According to the Chinese zodiac, people born in this year are philosophical, organized, intelligent, intuitive, elegant, attentive, and decisive. I was born in the Year of the Ox. According to the zodiac, I should be loyal, reliable, thorough, strong, reasonable, steady, and determined. If you want to find what you are, go to http://www.whats-your-sign.com/Chinese-zodiac-signs.html and see for yourself! Valentine's Day in Korea is a little bit different here than it is in the States. Unlike back home, Valentine's day here is about women celebrating the special men in their lives. Men typically reciprocate in March, but it is not unusual for Korean men to do something nice for their women on this day either. Chocolate is, of course, an important part of this holiday. The stores anticipate this by having huge displays of chocolate both inside and outside. Many convenience stores set up displays to lure in girls buying last-minute chocolate for their sweeties, and the bigger shops have many displays as well. Outside a convenience store on V-Day. A huge pink and white balloon arch and tons of chocolate. Another convenience store display on the way to work. one on every corner that there's not a Dunkin Donuts or phone store. Buying chocolate from the store is a bit of a cop-out, though. Most girls that really like their significant others wouldn't dream of giving their sweetie chocolate that wasn't homemade. Apparently the girls here are quite adept at melting chocolate and molding them into different shapes with messages iced on the top, or by creating chocolates that look like their boyfriends. That is dedication. 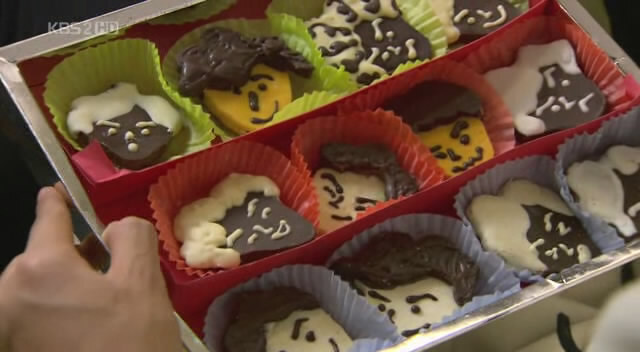 Chocolates featured in the K-drama "Boys Before Flowers". Another popular activity for couples on this day is to make something together. There is a cafe in Hongdae (part of Seoul) that features ceramic dolls that customers can buy and decorate together. It's a nice sentiment to make them in the image of each other and make a gift of them. 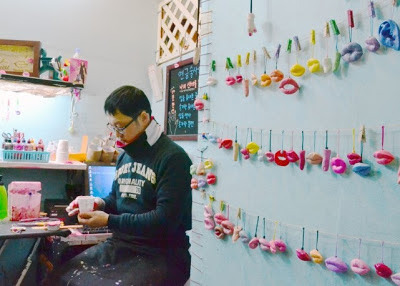 There is also a place where you can create a mold of your lips, and turn it into a cell phone charm or key chain to give to your lover. 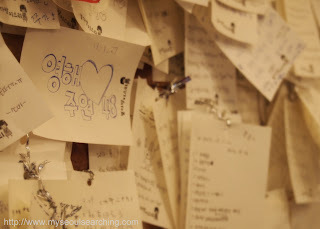 Koreans are also very into declaring their love to the world. There are a few locations where you can write notes and make these declarations. One such place is Namsan Mountain, and there are a few cafe's that do the same thing. Many people write love notes, confessions, make sketches, or write the typical 'X loves X' and hang it up for all the world to see. Another fun couple thing to do is to wear matching outfits. This has been termed the "couple look". This appears to be more prevalent in warmer months, but it is a way to let anyone who crosses your path know of your coupledom. Word on the street is that matching jackets and couple sneakers are all the rage right now.